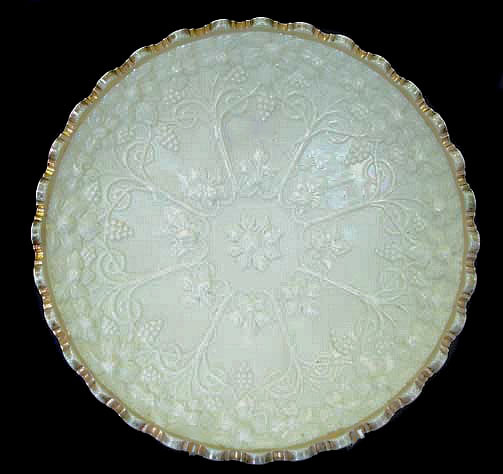 GRAPE FRIEZE: Circa 1914-1915 saw a brief revival of Northwood custard glass. 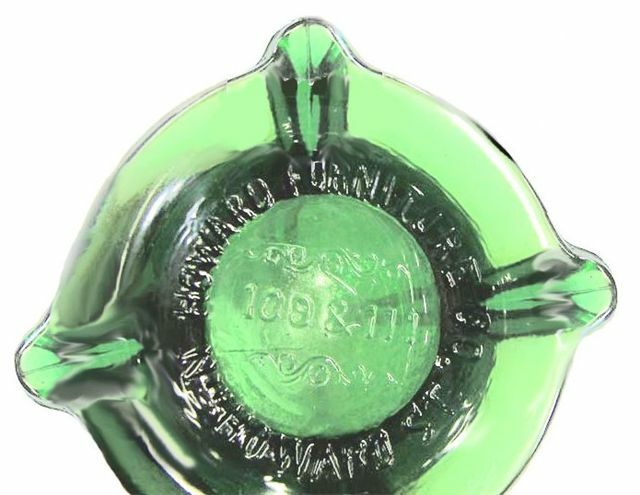 Originally part of the Northwood “Verre D’Orr” line which appeared in their 1906 Factory catalog, the name interprets “glass of gold”. Amethyst, cobalt blue and emerald green base glass are the main colors in that line, having a fired-on gold decoration. 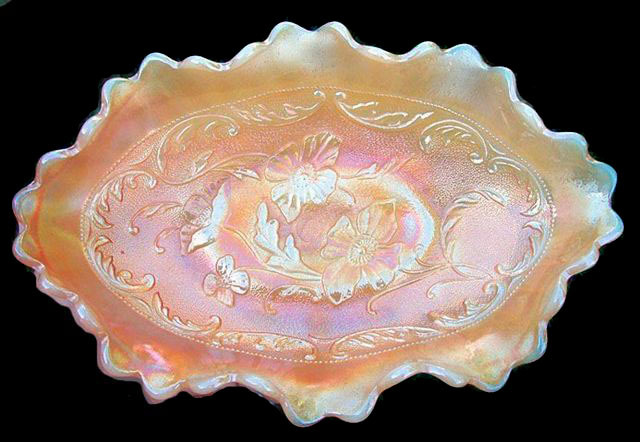 Pearlized custard in this 10”-11” three-footed ice cream shaped bowl/plate is the only iridescent color. While attending a Southern California Club meeting during the mid-80s, a member who has since passed away, brought a lovely plate for display. It was this pearlized custard, and the only one we have been privileged to examine during our many years of collecting/researching carnival glass. Fewer than a dozen examples in this iridized form are known to exist, so we are grateful to have seen one. She told us she purchased it at the Rose Bowl in Pasadena (where several other rarities have been discovered over the years). Remnants of the gold decorated edge are visible. Exterior is plain, with the Northwood trademark present. 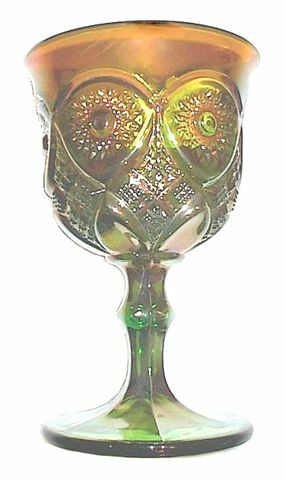 Green NEARCUT Goblet, 6 in. tall. Sold for $505. - eBay sale, 2-08. NEARCUT: goblets are extremely rare in amethyst, or marigold, as are water pitcher/tumbler in marigold. Green Goblets have not been confirmed until recently. Some amethyst tumblers are known, but a matching pitcher has not divulged itself. Rare compotes in the pattern (fashioned from this goblet mold) are also found in amethyst, green and marigold. Most examples in this pattern bear the Northwood trademark. 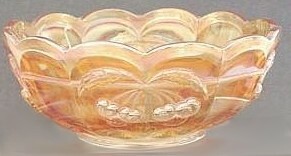 The 1906 Northwood catalog listed this semi-cut crystal line as #12. 34 different items were listed in the line, indicating it to be a very popular seller. Why then, would only four shapes be developed in carnival glass? Curious! DAISY and PLUME in rare Blue. Sold for $1100. 4-08 Wroda Auction. DAISY & PLUME : Few and far between, these blue three-footed candy dishes have not turned up in the past! Marigold, amethyst, green, white, ice blue, ice green, lime green are previously noted colors in this shape, although stemmed rosebowls and the three-footed rosebowls are known in cobalt blue. This example having the Blackberry interior are from Northwood manufacture. Dugan made a version of this pattern, as well. It has a single footed stem for a base. 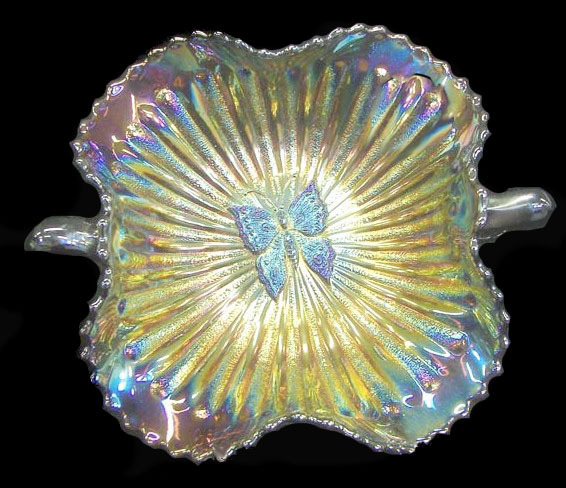 Both basic mould designs are carry-overs from the earlier non-iridized opalescent period. HOWARD FURNITURE CO. 109 & 111 N. Howard St.
molded into the base of green FOUR PILLARS Vase. FOUR PILLARS Vase: We display the “Howard Furniture” advertising which appears on the underside of some green vases. Should you like to view a green vase in this pattern, please click here. Not many of the advertising vases become available at public sales. Certainly they were produced in limited numbers. BLACKBERRY & RAYS Compote in Marigold. BLACKBERRY & RAYS Compote: This is one of the most under-appreciated and under-valued items in the entire Northwood carnival line of glass! It no doubt dates to the 1909-1910 period of production, is known in only marigold, amethyst and green, with fewer marigold compotes than in the other colors. A combination of Blackberry and Smooth Rays compotes, you will very likely not locate another example should you pass one up in a shop or auction. It is unlikely that more than a dozen or two (at most) are known overall. You may view a lovely green example by clicking here. BUTTERFLY Bonbon in Purple-Plain Exterior. BUTTERFLY bonbon: This example having the plain exterior is available in marigold, amethyst, green and smoke. While not plentiful, amethyst bonbons could not be determined as rare; however, not many of them display such radiantly bright iridescence as this example. By clicking here, you may view a marigold example in this pattern. 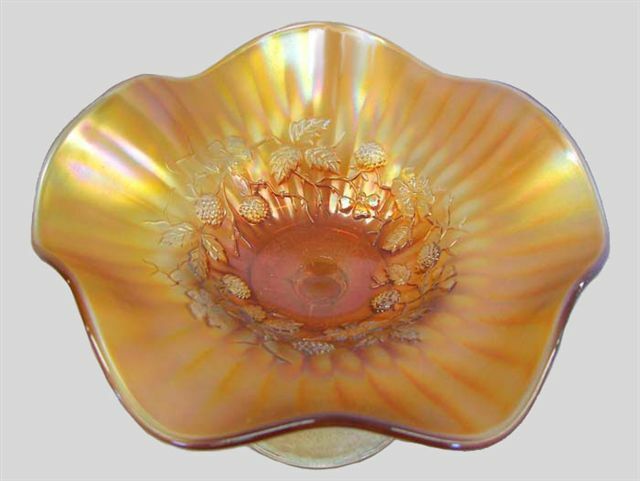 Master Berry Bowl in Marigold. CHERRY & CABLE Master Berry: The key to understanding this great old pattern dating to 1908 when the “full line” of Northwood’s Cherry went into their first iridescent effort, is that ALL OLD examples are marigold! The many Mosser and Westmoreland reproductions are in other colors. While it is the pitchers that create the buying frenzy, it actually is these berry bowls which are the most difficult to locate. Most examples carry the Northwood trademark. 5 in. White PEACH Berry Bowl. 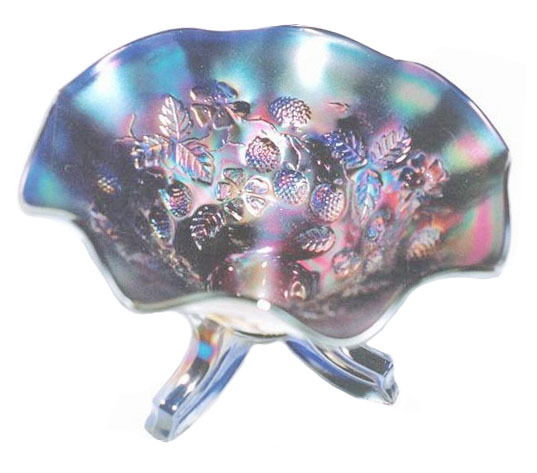 PEACH: These small berry bowls (5”- 6”) are found in cobalt blue, white, and sapphire blue. Matching master bowls in the same colors are also to be found. It is interesting that over many years of collecting, berry sets of any pattern seem to be quite scarce, or perhaps ignored by collectors by reason that there is no interior pattern? Please note the distinct similarity in overall shape/design of the basic mold to those of the Peacock @ The Fountain berry sets! Master Berry Bowl in Sapphire - unlisted color. PEACOCK @ THE FOUNTAIN: The Spring 1912 edition of Butler Brothers catalog offers this berry set in company with the table set and water set. Those ads continued through 1917 with ever-increasing wholesale prices. It must have been a very popular seller. The berry sets are found in marigold, amethyst, green, cobalt blue, white, ice blue, and ice green. Marigold over Custard POPPY PICKLE Dish. Perhaps 8-10 known in this rare color! POPPY Pickle Dish: The very shape and complimentary pattern on this oval pickle dish makes it one of our favorites among all of carnival glass! Notice the warm tones of the base of this piece. It glows under black light. Aqua opalescent examples are almost as rare as the marigold over custard. Although no ice green dishes have been found, other colors include: marigold, amethyst, green, cobalt blue, white, ice blue lavender, black amethyst and aqua. in Cobalt Blue - Master is only one known. SINGING BIRDS Berry Set: The design emerged in 1911 to meet the iridescent production demands. Full berry sets are available only in four colors; marigold, amethyst, green and cobalt blue. Table sets, water sets, mugs and a pedestal – footed sherbet are other shapes within this pattern range. Having our hearts sprinkled from an evil conscience and our bodies washed with pure water.